Homeowners only really concern themselves with their roof when things start to go wrong, such as loose tiles or leaking lofts, but by this time the damage has already been done. If only they’d paid more attention beforehand, chances are they wouldn’t be faced with costly roof repairs. Inspection: After Autumn, look for leaves and other debris on the roof and in the gutters, and be sure to inspect for any storm damage. Check for pieces of broken tiles – they are a sure fire way for water damage to occur. 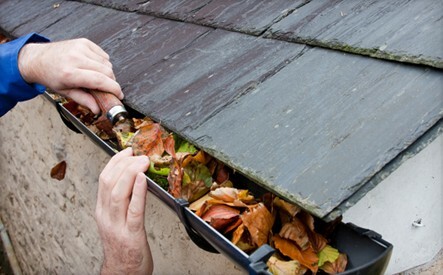 Gutter cleaning: Clean the gutters and downspouts after the trees have shed their leaves. Check for breaks or gaps in the seams and make certain that the brackets holding the gutters against the house are securely attached. Mind the trees: Leaning branches can scratch and gouge roofing materials when blown by the wind; falling branches from overhanging trees can damage tiles, and falling leaves can clog gutter systems. If trees are growing near the house, advise the homeowner to take immediate steps to trim these back from the roof. Fix flashing and sealants: Wind and weather can get underneath the flashing and rip it loose, causing mould and water damage. Make sure that the sealant isn’t dried out or loose. Loft inspection: The loft is where leaks are most likely to occur, so this needs checking out. If leaks go untreated, the structure of the home can be damaged too. They can even cause mould or algae. Offering this type of service is a sure fire way to prevent major roofing issues from occurring or becoming worse. For an even better return on your service plan, why not turn it into an annual event and bag yourself repeat business the following year? If you want further help and advice on roofing maintenance, call 01480 466777 – we’d be happy to discuss this with you. Alternatively, visit www.sigroofing.co.uk for all your roofing needs.